Higher Ground Bluegrass is New Mexico’s premier Bluegrass band, known for its tight harmonies and tasteful instrumentation. 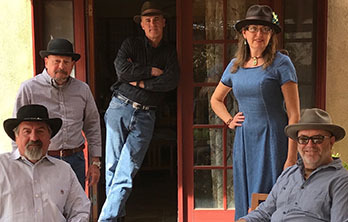 Performing both original material and a variety of traditional and contemporary selections, the band’s philosophy is to find dynamic arrangements for its original material, and to add something new and unique to standard bluegrass tunes to make them their own. With four members providing vocal contributions, the swapping of lead and harmonies offers something new and appealing for each song in their repertoire. HGB has recorded seven albums and won three NM Music Awards for original music. In 2018 the ensemble celebrated its 20th anniversary with the release of its album HGB20.